Come December and employees will have to submit proof of investments at the workplace, else tax will be deducted in coming months. You can save tax by investing up to Rs 1.50 lakh in equity-linked savings scheme ( ELSS) under Section 80C of the Income Tax Act. 1. 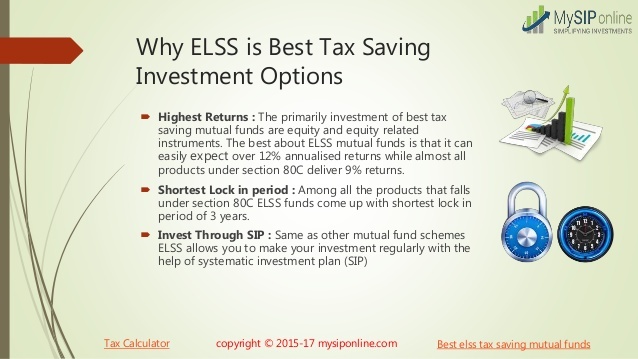 What is an ELSS scheme, or tax savings schemes? How much can one invest in them? Equity-linked savings schemes (ELSS) are investments in a scheme that offer the option to save tax. These funds invest in equities and investors can choose from either the dividend or growth option. You can invest any amount up to ?1.5 lakh in ELSS to save tax. Since such schemes invest in equities, they give investors the opportunity to earn higher returns over the long run. However, as is the case with allmutual fund schemes, there’s no guarantee of any fixed returns. 2. How does one invest in an ELSS scheme? Once an investor is KYC-compliant, he can invest in an ELSS scheme just like the way he does in any other mutual fund scheme. Investment can be done by filling the relevant form and writing a cheque, either through online fund house websites or through online portals. It is also possible to invest using SIP or STP. 3. Does ELSS have any advantage over other tax saving schemes available under Section 80C? Amongst all the tax saving schemes, ELSS has the shortest lock-in period of three years, while the Public Provident Fund (PPF) has a minimum lock-in of 15 years, and allows only conditional withdrawal before that. The Employee Provident Fund is usually locked in for the term of your employment. Other tax saving products such as Tax-Saving Fixed Deposits, or the National Savings Certificate (NSC) are locked in for a period of five years and more. The National Pension Scheme (NPS) is locked in until you are 60, and only allows conditional withdrawal. If you opt for the dividend option, you can get intermittent cash flows as well in ELSS schemes. Finally, in an ELSS scheme, you do not pay any tax on dividend or when you redeem the units. 4. What options does an investor have once the compulsory lock-in period of three years is over? Investors have the option to continue to hold the mutual fund units after three years or redeem them. Financial planners recommend considering ELSS as part of equity allocation and continuing to hold if it performs in line with investors’ expectations as it would help in meeting financial objectives.